A few weeks ago, while discussing dessert choices after a wonderful dinner here with my sister and mom, I suggested the homemade pumpkin pie and wondered "do you think they serve it à la mode?" My mom proceeded to freak out and thought it sounded revolting?! Ice cream, pie - no matter what the flavor, this is a wonderful combination in my eyes. 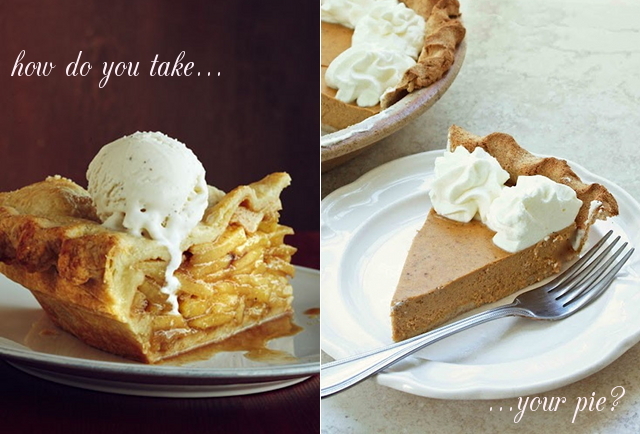 So I'm wondering - would you eat pumpkin pie à la mode? I might be alone in this one. Do you prefer whipped cream, or plain? This is a random topic, but such thoughts are on my mind during the week of Thanksgiving! you are going to hate me, but pumpkin pie and ice cream is about as gross as apples and milk eaten together- it is the same concept! but it makes sense that you would like it ;) whatever dessert you and megan make, save some for me! happy to see the duds are finally back! Ice cream and pumpkin pie go amazing together! I'd even try pumpkin ice cream, although vanilla is best I'm sure! I don't think I've ever had pumpkin pie with ice cream, but I wouldn't say no to it. I love homemade whipped cream though!